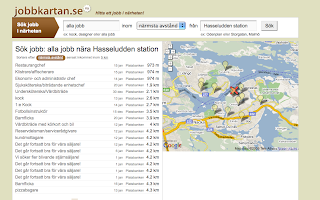 My project is called Jobbkartan.se ("the job map"). It's a search engine that lets you search for jobs based on their geographical location. Even if you already have a job, you can find a new one, closer to where you live. The information about the jobs comes from the swedish job board ("Arbetsförmedlingen"). Each ad is geocoded (based on its zip code) and placed on the map. How will I make money? Either through Google Adsense Ads (which is already up and running, I've made my first dollar already!) or pay-per-click deals with other job-sites that I can add to my index. Who am I? Here's my 24hbc-presentation (in Swedish). Du kanske kan sälja sajten till oss? Intressant! Hur mycket vill ni bjuda, mellan tummen och pekfingret? Låt oss ta det i veckan som kommer via ett telefonsamtal! Jag har en del intressanta tankar som jag skall ta med delägare i www.salespeople.nu som antagligen är det bolag som kan vara mest intressant för ditt projekt.